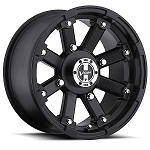 ATV Wheels and UTV Wheels by ITP, Motosport Alloys, STI, Vision and more! Select which style of ATV wheels you are looking for from the options below. 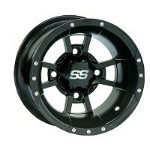 We've got a large selection of 12, 14, 15, 16, 17 & 18 inch ATV & UTV Wheels along with several styles of sport ATV rims. We carry all leading brands like ITP, Motosport Alloys, Vision and more! Don't worry about hunting down all the little parts, we throw in lug nuts and center caps with all ATV wheel purchases. 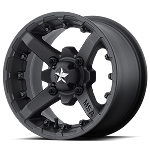 (Not all ATV wheels have center caps available) Keep in mind, all pricing shown on our website is the final price you will pay, no hidden fees when you shop with us. Orders over $100 ship for free to the 48 states. Orders $99 or under there is a $10 flat rate shipping charge. In addition to our excellent pricing we have super fast shipping. All orders ship out within 1 business day, if there is a problem getting your order out we will notify you promptly. Now is when you quit reading this and start shopping! 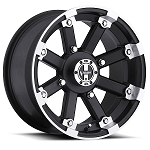 If you don't know the difference between 12" & 14" ATV Wheels click here: 12" or 14" wheels?